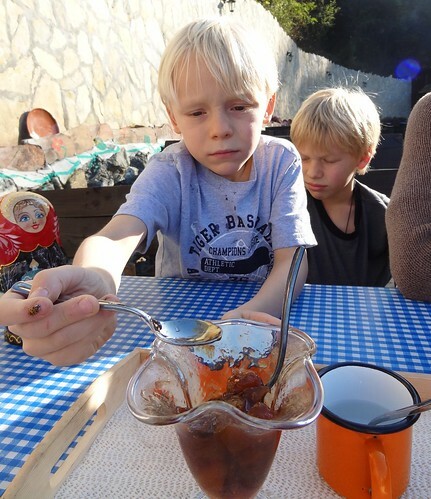 My son Oliver is trying a peach slatko last weekend at the restaurant Stari Majdan. Slatko is an interesting traditional Serbian fruit preserve. It is like a jam but with chunky pieces of fruit and it is served with water. It is very sweet and immediately afterward, one needs a sip of water. I guess that is why it is named slatko which means “sweet” in English. It used to be served to guests when they arrived in a Serbian home. Today, it is only found in rural areas in Serbia or occasionally in green markets in the city. Nadia absolutely loves it and we usually have a jar in the kitchen. I’ve seen that strawberries and figs are the most common types. My friend mentioned a watermelon (lubenica) slatko that I would like to try. Update – July 9, 2012 – I read an article in the Spring 2012 edition of BelGuest that mentioned slatko comes from the Sephardic Jewish community of Belgrade before World War II. The Spanish (Ladino) word for the desert is dulse and the Serbs adapted it from their interaction with the large (22,000) Jewish community in the city.